Option #2: 3 easy payments $60.00 each. Option #3: Pay now only 25% down $50.00. Then 12 months for $15.00 monthly. Also you can only rent for any period: refundable security deposit $50.00. Then $18.00 monthly payments. Sold as an OUTFIT: This means that included in the purchase are the violin, bow, case, and rosin, all that is necessary to start playing. This outfit is intended for beginners and students of all ages from the age of four to an adult. Therefore, it is available in all sizes starting from 1/32 size (for a child approximately 4 years old) and up to 4/4 for an adult person. 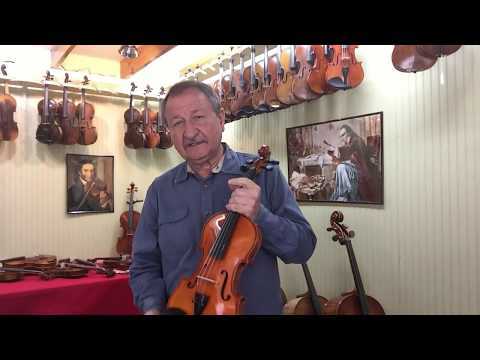 This violin outfit is the basic model, its main advantage is the low price, the comfortable playing, and the ease of sound resonance, to make it easier for beginners or the child to get used to playing the violin. When setting up the instrument, thinner strings are used and a lower height of the strings above the fingerboard is set up. With such a mounting, a child or beginner who is not yet very skilled at controlling the bow and the muscles on his fingers are not so strong, can easily extract a normal sound from the violin, and gradually, practicing, step by step to improve their violin skills. Very good violin. It is very easy to play on and is very responsive. I love how it is adjusted. My child loves playing on it.